You may have recently bought a brand new Kindle Paperwhite device, but you do not have much idea about operating it. Or you may have owned the Kindle device for quite some time, but cannot do more on it than just the basics. Whatever the case may be, this eBook will let you explore your Kindle... read more Paperwhite from the surface right down to the depths of it. 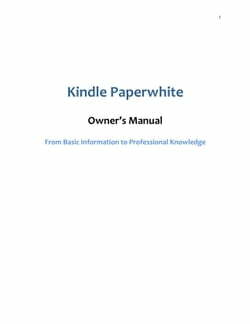 When you have finished reading this book, you will become an expert with your Kindle Paperwhite, will be able to operate it effectively and will utilize it to the utmost. As of now, you are just one step away from learning the secrets of the Kindle Paperwhite. Just turn the page and discover what your incredible Kindle Paperwhite has in store for you.